This Chandra X-ray image shows the central regions of two colliding galaxies known collectively as "The Antennae." The latest Chandra data reveal a large population of extremely bright X-ray sources in this area of intense star formation. These "ultraluminous" X-ray sources, which emit 10 to several hundred times more X-ray power than similar sources in our own Galaxy, are believed to be either massive black holes, or black holes that are beaming their energy toward Earth. 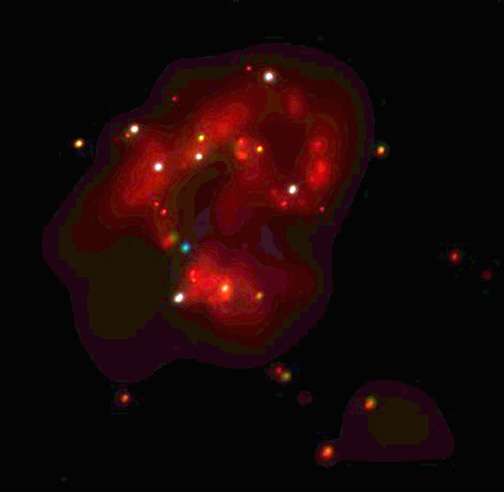 In this X-ray image, red represents the low energy band, green intermediate and blue the highest observed energies. 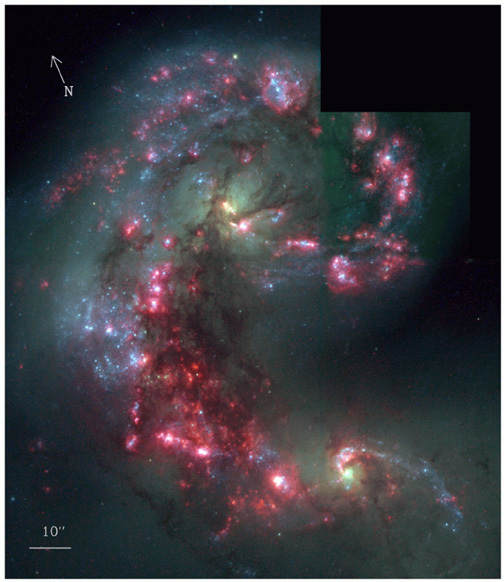 The white and yellow sources are those that emit significant amounts of both low- and high-energy X-rays. The Antennae Galaxies, about 60 million light years from Earth in the constellation Corvus, got their nickname from the wispy antennae-like streams of gas seen by optical telescopes. These wisps are believed to have been produced by the collision between the galaxies that began about 100 million years ago and is still occurring. Scale Image is 4.0 arcmin across.